St.Helens band Gravy Train were one of hundreds on the undercard of the nascent progressive rock scene at the turn of the ’60s into the ’70s, and they made their first two LPs for Philips’ underground subsidiary Vertigo. Their first self-titled album was released in 1970 and as with almost everything on the label that wasn’t Black Sabbath or Uriah Heep it received virtually no promotion and so disappeared without trace. A well executed if rather derivative record – it’s a wonder Jethro Tull didn’t sue – I love it, mainly for nostalgic reasons, admittedly. The second LP, (A Ballad Of) A Peaceful Man, a year later showcased a much matured approach, and moving on from their tentative beginnings the band had now forged their own sound, based on the slightly jazzy inclinations of keyboard player J.D. Hughes, who also contributed sax and flute, and the acid-fried guitar breaks of Norman Barratt, who with his distinctive croaky upper register singing contributed another individualistic twist to the group’s sound. Side one consisted of a three-song suite that put them firmly into the new progressive rock bag. Sadly, this LP too vanished with hardly a ripple, and so the band switched labels to Pye Records’ hip subsidiary Dawn, hoping for more promotion, somewhat naively as it turned out. 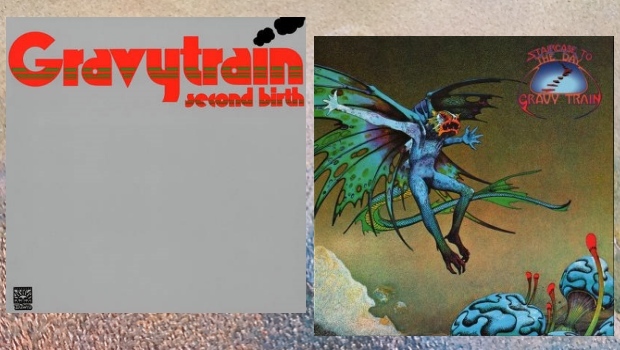 Their first album for Dawn, the appropriately and optimistically titled Second Birth, saw the light of day in 1973. Unlike a lot of their prog rock contemporaries, Gravy Train were not afraid to highlight social and environmental concerns in their lyrics, directly hinted at in some of the song titles. Occasionally a little too earnestly it has to be said. You can almost hear principal songwriter Norman Barratt’s conscience as well as his cracked voice straining to near breaking point on opener Morning Coming. This band could rock too, with more than a hint of funk, as the following Peter testifies, with some fine sax blowing from Hughes, Barratt’s voice bearing some similarity to that of Roger Chapman on this one. Like almost every other band of the era that ever picked up an acoustic guitar, the influence of Crosby, Stills and Nash is felt, this time on September Morning News. Another all-pervasive influence and unavoidable in the early ’70s was The Beatles, and Fields And Factories blatantly lifts part of its vocal melody wholesale from Lucy In The Sky With Diamonds, but the rest of the nearly nine-minute tune has enough of its own character to make that excusable, with more sax extemporising and some fine acidic guitar from Norman. The title track is a good example of the progressive rock of the time, and bears comparison with any of its more well-known contemporaries. It is another paen to man’s abuse of nature, and with its three-part guitar and flute harmonies, and its fast and technically demanding sections it stands as evidence of a band revelling in their fast increasing proficiency. Gravy Train pulled out all the stops for what would turn out to be their final album, Staircase To The Day released in 1974. After using producer Jonathan Peel (not to be confused with the DJ of similar name) for all three of their previous albums, and becoming dissatisfied with his efforts, their manager suggested Vic Smith, or Vic Coppersmith-Heaven to give him his full name, by which he would later become well-known for his work with The Jam and others. They had already recruited George Lynon as a second guitarist, and their new producer also enlisted P.P. Arnold to supply backing vocals. They also got the then flavour of the month cover designer to do his thing with the cover art. No prizes for guessing who that was! With the expanded line up, harmony guitars and three-part harmonies beefing up the sound, Norman Barratt, who by now was almost completely in charge of the song writing, donated a set of hook-laden prog-tinged songs and proto funk-rock extravaganzas, years before the term was coined. That term applies especially to the hard driving Busted In Schenectady, a wonderfully fuzzy snapshot of prog-spacerock-glam confusion as it jams away before impacting like a comet that got too close. Norman Barratt’s songwriting capabilities had continued to develop, and the spacey funk of opener Starbright Starlight is followed by an epic piano ballad with a good old great big ’70s shout-along chorus by the name of Bring My Life Back To Me, a tune you can imagine being played to an arms-aloft bewildered looking crowd on Top of the Pops. Fabulous! Never Wanted You might be what Uriah Heep would have sounded like if they had worn basketball sneakers instead of hobnailed boots, and the first long track is the title track, whose slow unfolding melody again recalls the Heep, being very similar to July Morning, but again is far more subtle than anything the Heep could manage. Side two opens with the dirty glam-funk of Going For A Quick One, a song so rooted in its time you can smell the patchouli and stale beer’n’fags. Because of that, it is quite lovely! The variety of music on offer on Staircase To The Day shows that Gravy Train were far more than a “prog by numbers” band, as their first two LPs at times indicated, but they still had a penchant for fast arpeggios as fills, but sensibly enough use them sparingly on this album. One place those fills occur is during The Last Day, which is led by a slow and simple bass riff off the beat that makes it an irresistible toe tapper full of atmosphere. The funk in the music that was never far from the surface of these songs is given full exposure on Sanctuary, the b-side to a single and included here as a bonus track. This song is very close to what the Average White Band were doing at a similar point in time, but with added extra cojones. Sadly, Staircase To The Day fared little better than its predecessors, and fed up with living a hand to mouth existence over the past five years – the exact opposite of being “aboard the Gravy Train” as their atypically Slade-like single and bonus track proclaims – the band first lost keyboard player Hughes, and despite soldering on for a while afterwards a split was inevitable, if sad, as the derailed Gravy Train had a lot to offer, but never really left the engine shed…enough puns, already! The sound on these remasters is top notch, and playing Staircase… next to my treasured vinyl original, the difference in depth and clarity is palpable. This, combined with Malcolm Dome’s comprehensive sleeve notes, containing interviews with most of the band members, serve to underline that Esoteric do it right, again.